Already major bestselling authors in the UK, the brilliant creators of the Monkeewrench team and their law-abiding counterparts on the Minneapolis PD are setting a new standard for the modern thriller, combining brilliant plotting, razor-sharp dialogue, and vivid characters into a potent brew. 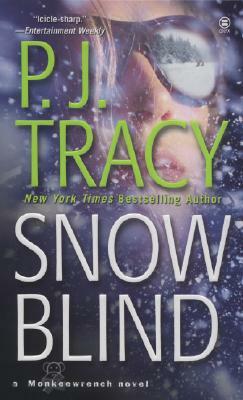 And now, with Snow Blind, this duo gives us their most original and irresistible novel yet. Nothing's bleaker than Minneapolis during the winter, the season that, to some longtime residents, lasts eleven months of the year. So what better way to bring a little cheer to the good people of the city than by sponsoring an old-fashioned snowman-building contest? In a matter of hours, a local park is filled with the innocent laughter of children and their frosty creations. But things take an awful turn when the dead bodies of Minneapolis police officers are discovered inside two of the snowmen- sending the MPD and Detectives Magozzi and Rolseth on high alert. The next day, Iris Rikker, the newly minted sheriff of rural Dundas County, comes across another dead cop. Fearing that Rikker's inexperience will hamper the investigation, Magozzi and Rolseth head north-in a blizzard-to hunt for clues. As Grace MacBride and her crack computer jocks at Monkeewrench comb cyber-murder websites for connections, a terrifying link emerges, connecting the dead cops, Magozzi and Rolseth, and Monkeewrench-a link that must be broken, before it's too late.